Those wondering how to determine the top 5 penny stocks to buy are not alone. There are so many stocks selling at $5.00 or under, the traditional boundary of penny stocks, it can be tough to determine which ones to buy. We put together some penny stock investing tips here – take a look. If you're looking for the top 5 penny stocks to buy, you need to keep penny stock volatility in mind. If penny stocks are chosen well, they can be very remunerative for investors. Some, like Cellectar Biosciences Inc. (Nasdaq: CLRB), can receive good news on research and development that propels their share price up tremendously in a short period of time. On the news, the share price for CLRB shot up 127% on the week. Sweet profits like these attract investors. However, you need to keep in mind that penny stocks are a volatile group of investments. What goes up can come down – and come down quickly. You need a pronounced risk tolerance to think about the top 5 penny stocks to buy. Along with having a strong risk tolerance, investors need to be diligent about thoroughly researching prospective penny stocks to invest in. Money Morning Chief Investment Strategist Keith Fitz-Gerald advises that investors look at the firm's 10-K and annual reports. You need to understand the strategic plan, the outlook, and the products and where they fit into the company's markets. Can top management execute on its plan? What is their track record? Most companies have information on their websites. Another option is calling or writing for information. It's a good idea to stick to the major averages when you're prospecting for the top 5 penny stocks to buy. Although penny stocks are traded on the Pink Sheets and Over-the-Counter Bulletin Board (OTCBB) as well as the New York Stock Exchange and the Nasdaq, the latter two have stronger reporting requirements and regulation. It's likely that when you begin your research on a penny stock, you will find information more easily if they are NYSE or Nasdaq listed. If you can't find information about a penny stock, move on to the next prospect. Never invest in a stock that doesn't provide or release information to its owners, the shareholders. 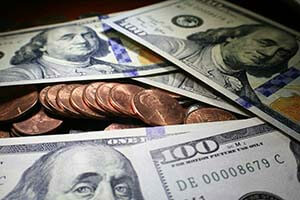 Another good plan in finding the top 5 penny stocks to buy is to follow a prudent investment plan. Your overall portfolio should be diversified, and only a small portion should be penny stocks, with no more than 2% of your total investment portfolio consisting of a single penny stock. Once you know how to approach penny stocks overall, how do you determine the top 5 penny stocks to buy? One excellent method is to perform your research with an eye toward today's top trends. No matter how the broader markets are trending or what the Fed does, there are always markets that are growing, where products and research are needed. You need to tap into those markets to find the top 5 penny stocks to buy. How about an $18 billion market in just one sector of green energy? That's what Money Morning top 5 penny stocks to buy candidate Fuel Cell Energy Inc. (Nasdaq: FCEL) estimates as the size of hydrogen fuel cell power generation – its primary business. For the last 10 years, FCEL has focused on onsite "microgrid" fuel cell power plants. This year, it has achieved significant traction, winning a bid for Pfizer's Connecticut research facility and other projects in Connecticut, California, and Germany. If you've been in the market to purchase any type of tech device recently, you may have noticed the popularity of touch screens. One way to play that market is the top 5 penny stock to buy Neonode Inc. (Nasdaq: NEON). NEON makes touch screens for any tech device you can think of: PCs, laptops, smartphones, wearables, and GPS devices. Earlier this year, NEON announced a major agreement with Lexmark for its screens. If you've been following the news, perhaps you've seen a feature on the driverless car. If you've been following tech news specifically, you almost certainly have learned that as tech titans, Google Inc. (Nasdaq: GOOG) and Apple Inc. (Nasdaq: AAPL) (among others) are part of the race toward the next new thing. When self-driving cars become a reality, they will be computers on wheels. Money Morning recommends STMicroelectronics NV (NYSE ADR: STM) as one of the top 5 penny stocks to buy based on its leading position in building chips for the car business. In the next 10 years, the market for driverless car technology worldwide will be near $42 billion. By 2035, it is forecast to rise another 83% to $77 billion. STM should be a major beneficiary. One of Keith Fitz-Gerald's Unstoppable Trends is a global rise in healthcare spending. Healthcare spending is forecast to best the gross domestic product growth rate of most companies, with firms like Deloitte and McKinsey, and the International Monetary Fund projected annual increases of 4% to 6% through 2017. Investing in a biotech penny stock is a way to enter the rapidly growing healthcare market. It's why the fifth of our top 5 penny stocks to buy is Novavax Inc. (Nasdaq: NVAX). NVAX researches and develops vaccines, including those for pandemic flu viruses and rabies.